Your options to retrieve the account and password you use to sign in and install or reinstall Office, or to manage your Office 365 subscription vary depending if your product is an Office for home or Office for business product. Click here to see what products are included under Office for home or Office for business. The account you associated with your Office for home product is the same email you used when you bought or activated Office the first time, or what you use to sign in and install or manage Office from your account portal. If none of these options help and you still can't remember your Microsoft account, see When you can't sign in to your Microsoft account for additional things to try. Contact your admin who can retrieve the username and reset the password for your work or school account. If you have Office 2016 installed, in most cases you can view the work or school account associated with Office by opening a desktop Office application. Open any Office application, for example Word or Excel. Select File. If you didn't open an existing document, you may need to create a new document to see the File menu. If you don't see Belongs to:, select Update Options > Update Now. After the update is complete, close the app and then reopen it. Look for the Belongs to: account. 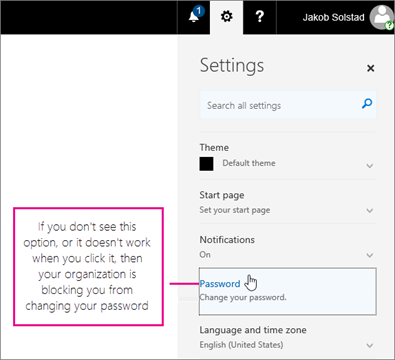 If your admin has given you permission to reset your password go to, passwordreset.microsoftonline.com/. Contact your admin if you don't have permission to change your password. If your admin has given you permission to reset your password go to, passwordreset.activedirectory.windowsazure.cn/. Contact your admin if you don't have permission to change your password. You can only do this if your admin has given you permission to update your password in Office 365. Go to www.office.com/signin and sign in with your work or school account username and existing password. Go to login.partner.microsoftonline.cn and sign in with your work or school account username and existing password. Go to portal.office.de and sign in with your work or school account username and existing password. Go to Settings > Password. The sign in location for Office 365 operated by 21Vianet in China is, https://login.partner.microsoftonline.cn/. If you're signing in to the correct location, but still can't remember your username and password, contact your admin. The sign in location for Office 365 Germany is, https://portal.office.de. 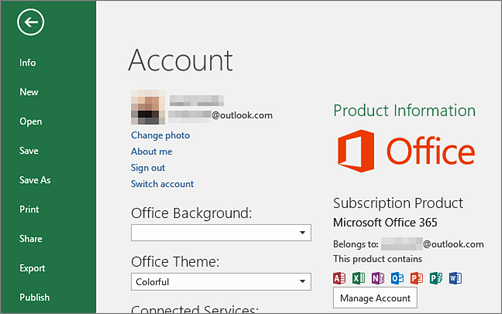 If you're trying to sign in to Office with your personal Microsoft account, but you're already signed in with your work or school account, you need to sign out and then sign in with the correct Microsoft account (or vice versa). Another option is to open a private browsing session in a new browser window. (Search your browser's help if you don't know how to do this.) When you open a private browsing session your browsing data (history, temporary internet files, and cookies) isn't saved so you can sign in with a different account.